Saw a friend's Facebook profile today and it was inspired by a techcrunch article (more examples on the french techcrunch article!). I actually did think about this before, but never did get around to doing it. Took about 5 mins to do just that this morning! I wouldn’t be surprised if his unique way of using notably the 5 images now displayed on the top of a profile page becomes a hit with other users or sets off a wave of other innovative profile picture displays. For anyone who wants to copy his style, all you have to do is block the other photos you’re tagged in and upload photos to your profile pictures album that are the exact size (yes, down to the pixel) of the display on Facebook and voilà! Well I customized mine and it rocks! 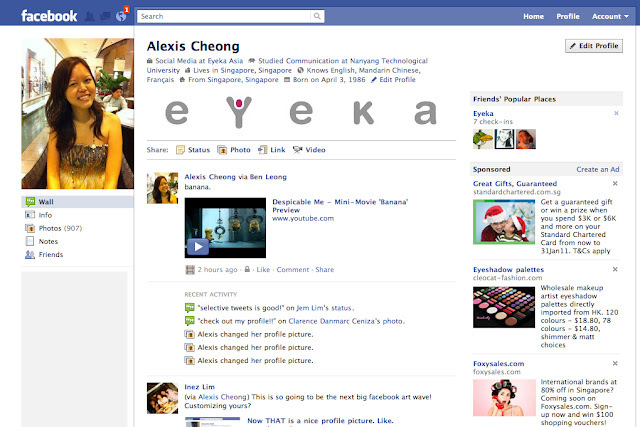 FYI eYeka is the name of the company I work in and it's just nice, 5 letters. It is actually really simple to do. 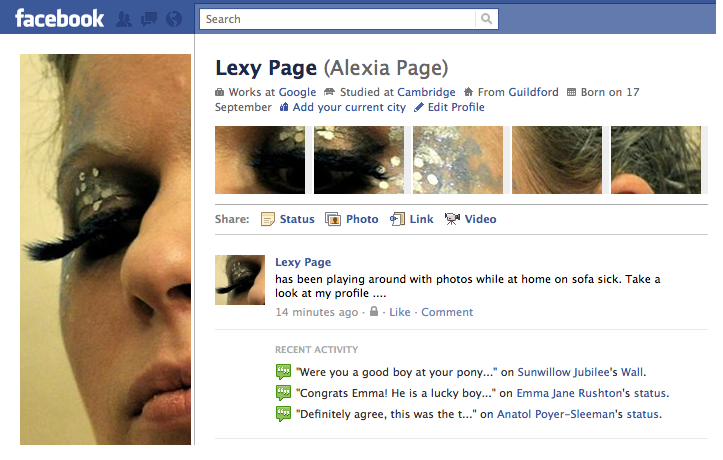 Here are the steps on customizing the your Facebook Profile using tagged photos. 1. Select and decide on the five thumbnails you would like to display. Take note also of your Facebook Profile Picture and decide if you want to use it in conjunction like in Gestalt's theory. Here's a really nice one featured on the Techcrunch article. 3. Upload your new profile picture and thumbnails. For those 5 thumbnails, choose to either upload them in an new album, or your profile picture album (changing your profile pic successively for 5-6 times). 4. Go to the album you uploaded those thumbnails to and rearrange them in order. Click on the 'Tag' button and select your own name. Tag the thumbnails in backwards sequence. Let me know if you decide to do something! EDIT: my friend Jun Lin decided to upload his own illustration on his profile and it totally rocked! 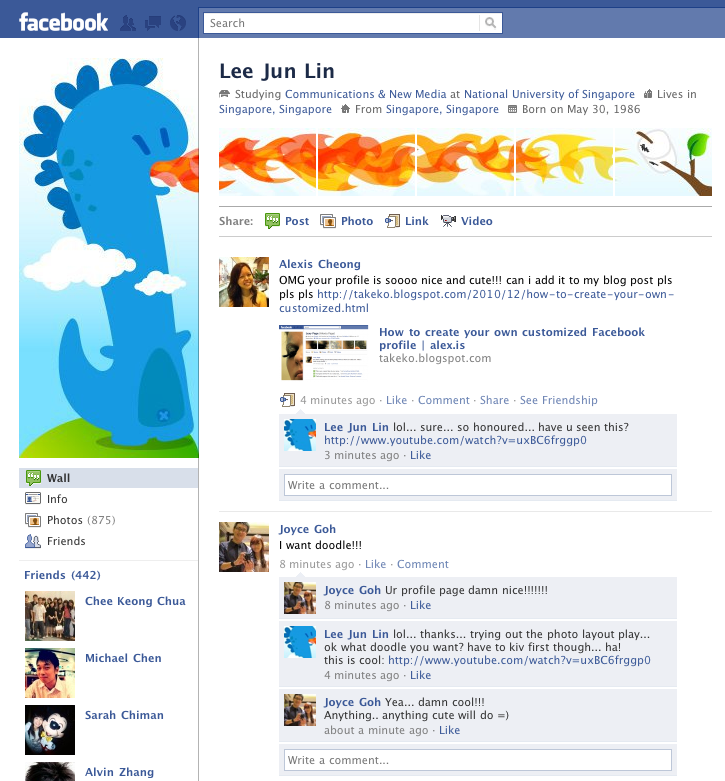 it will so win the best Facebook profile customization award if there is any. check out his tumblr blog too! Browse upon ur blog. I must say it's very informative! Tried out the FB profile. Can't post a pic here, it's "where my xmas presents?" in word and jumble up form. Some friends had been asking how I did it. Merry Christmas!